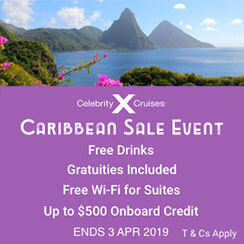 Discover all the colours of the Caribbean with Celebrity Cruises. From pristine white-sand beaches and sparkling turquoise waters, we'll show you the kaleidoscope of the Caribbean. Book an eligible Ocean View Stateroom or above by 3 April 2019 and enjoy free drinks, free gratuities, and $400 onboard credit per stateroom. Plus, when you book a Suite you’ll also receive an Unlimited Wi-Fi package and an extra $100 onboard credit. 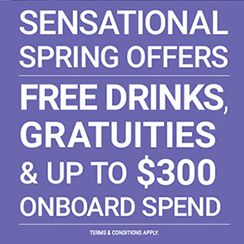 FOR YOUR SENSATIONAL SPRING OFFER, BOOK TODAY. Luxury comes as standard on every Celebrity Cruises holiday. Filled with added extras to help ensure you will have the holiday of a lifetime, these include speciality dining and beverage packages, a diverse range of shore excursions to give you the most choice at each port of call, as well as over a dozen ways to celebrate that special occasion whilst onboard. Don't just appreciate art, experience it. Witness the incredible, gorgeous art of glass-blowing with intimate live demonstrations. Watch and learn from professional glass-blowers in this one-of-a-kind exhibition on Celebrity Solstice, Celebrity Equinox, and Celebrity Eclipse. Featuring 26 Apple Macbook Pro workstations, with Apple products for sale. 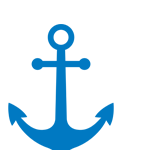 Classes on how to use Mac products and software are available on most sailings. Remain onboard and enjoy some of the ship’s services until 90 minutes prior to the ship’s next departure. Complimentary breakfast and lunch, non-alcoholic drinks, first-run movies, access to the pool, fitness centre and select spa services, along with an extra hour in your stateroom. On European sailings only.